Anchor historian Dave Burkhart on the story behind Zymaster No. 4. How did Fort Ross, a nineteenth-century Russian fur-trading colony ninety miles north of San Francisco, become the name of the latest release in our Zymaster® Series? The answer is in the beer: Yerba Santa, wheat, and barley. For centuries, Belgian farmers brewed beers that were uniquely local. Their farmhouse ales, which became known as saisons, were made from the grains they cultivated and the herbs they found growing wild nearby. Each was crafted from local ingredients, creating distinctly local flavors and aromas. I had several conversations with Mark Carpenter, our brewmaster, while he was developing the recipe for our Zymaster Series No. 4: Fort Ross Farmhouse Ale™. From the beginning, of course, his basic concept for our saison was rooted in Anchor’s long tradition of making quaffable, well-balanced beers with character. As Mark’s recipe came together, though, it became apparent that the balance in our saison would not just be in its flavors and aromas but also in the sources of its ingredients. Our farmhouse ale would be made with both wheat malt and barley malt, as is traditional. But while most of the wheat and barley would be American, we would also use quite a bit of toasted wheat malt from Belgium. To be true to the style, we would also do what we have done only on rare occasions at Anchor. We would use a yeast other than our own. It would be a Belgian-saison-style yeast, as one would expect, but sourced locally, from a San Francisco Bay Area lab. And, in addition to hops, we would use a special herb to add flavor to our farmhouse ale. A Belgian herb, of course, would have made our farmhouse ale taste Belgian. But it wouldn’t have been true to the essence of the style, since farmhouse ale is all about the wild herbs growing almost literally in the farmer’s backyard. Yerba Santa, a native California herb, seemed the perfect choice. 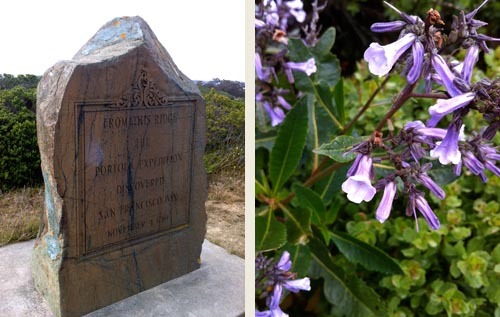 Named Yerba Santa (“holy herb”) by the Spanish missionaries, this perennial shrub grows wild on Sweeney Ridge to the south of us, where members of the Portolá Expedition first sighted the Bay of San Francisco in 1769. It also grows wild to the north of us, on Marin County’s Mount Tamalpais. And it also grows wild near Sonoma County’s Fort Ross, just a couple hours’ drive up the coast from our brewery. Russia’s early presence in North America was all about its fur trade with China. Sea-otter pelts were highly prized by China’s elite, who offered the Russians tea, cloth, and porcelain in exchange for them. 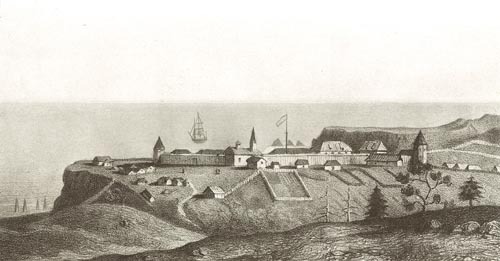 In 1812, in order to facilitate the Russian-American Company’s hunting of sea otters along the California coast and to support itself and Russia’s other colonies, especially Novo-Arkhangelsk (New Archangel, now Sitka, Alaska), with much-needed grain, Fort Ross was established. One might say that except for the land and the weather, Fort Ross was the perfect place for a farm. Nevertheless, the Russians made a go of it, harvesting “bread plants” like wheat and barley with the help of the local Indians. Primitive conditions were compounded by primitive methods. Although they had a windmill—built in 1814 to grind grain into flour for bread for both Fort Ross and Sitka—reaping was done with sickles and threshing with horses, which trampled the grain to separate the wheat from the chaff. 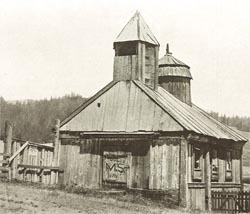 Finally, in 1836, a Russian agronomist named Egor (Georgii) Leontievich Chernykh, came to Fort Ross and built a thresher. 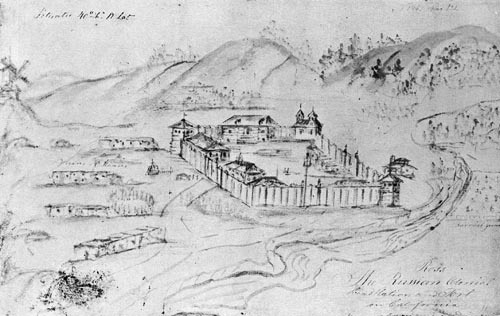 In 1841, upon Fort Ross’s abandonment by the Russians, it was listed in the inventory of items sold to John Augustus Sutter. “Among the most notable dispositions, executed in 1840 and 1841 in the Russian possessions in America, we cite first the abandonment of the Colony Ross, established in 1812 on the coast of New Albion. This establishment had been formed in the hope that the cultivation of fields in this part of America where the climate is less severe [than Alaska’s], would offer an easy means to provision the other colonies situated more to the north on an arid coast. At first the sea otter were found in great numbers in the vicinity of [Fort] Ross, so much so that the hunt and the commerce in pelts seemed to promise enormous economic returns. Fort Ross was history. But the local Kashaya people were not. 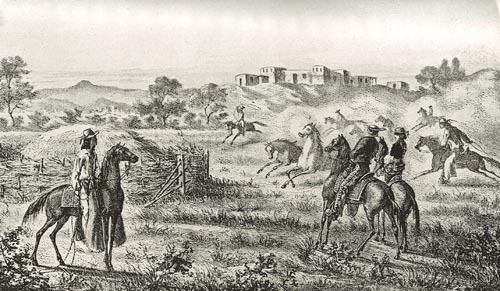 The Kashaya, whose name means “expert gamblers,” had willingly and successfully gambled on providing the Russians with the land and the labor that made Fort Ross possible. They were the area’s original settlers, moving in and around it according to the seasons for thousands of years. 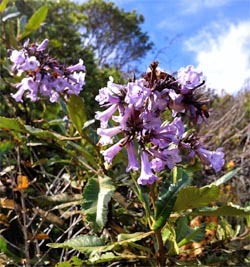 In May, just before the delicate purple flowers of the Yerba Santa began to bloom, the Kashaya would harvest this wild, native plant. Probably no plant was more valued as a medicine by the Indians of Northern California. 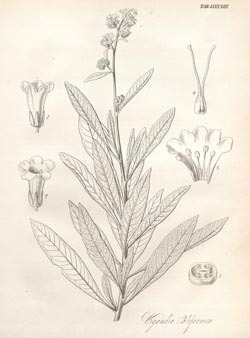 Smoked or chewed like tobacco or brewed like tea, Yerba Santa was used to treat a variety of ailments, from asthma to headaches. Yerba Santa’s botanical name, Eriodictyon californicum, denotes the “wooly net” of its unusual leaves and the California origins of this perennial shrub. Our release of Zymaster No. 4: Fort Ross Farmhouse Ale™ coincides with the emergence of its beautiful but ephemeral flowers. For San Franciscans, by the way, the best place to find Yerba Santa in the wild is along the Sweeney Ridge Trail, about fifteen miles south of the City. As of June 1, my most recent hike to the spot where Spanish explorers “discovered” San Francisco Bay, Yerba Santa was very much in bloom. Take the Sneath Lane exit off 280 and head west on Sneath until the street ends and the trail begins. 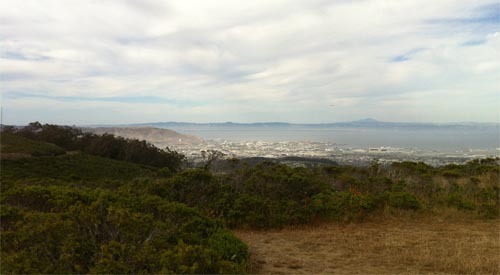 It’s a 1.8- mile hike up to the SF Bay Discovery Site. 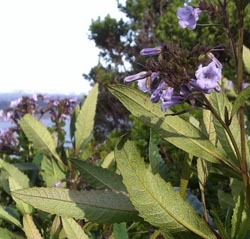 Halfway up the hill, you’ll see Yerba Santa growing on both sides of the trail. Mark Carpenter had experience brewing with Yerba Santa and was familiar with the unique bitterness and almost hay- or alfalfa-like flavors and aroma of this uniquely Californian herb. It would provide the perfect complement to the sweetness from the malt and the fruitiness and clove-like flavors from the yeast, creating a uniquely Californian farmhouse ale. But if neither the Russian colonists nor the Kashaya people made beer, why call our farmhouse ale Fort Ross? The answer is indeed in the beer, because the true essence of Belgian-style farmhouse ale is not in the use of Belgian ingredients. Rather, it’s as much about the farmer as it is about the farm. Belgian farmer-brewers cleverly combined what grew on the farm with what grew around the farm to create their uniquely and wonderfully local farmhouse brews. The farmers at Fort Ross, with the help of the Kashaya, grew wheat and barley. And what grew around their farms was Yerba Santa. They didn’t make beer (if only they had! ), but for a brief moment in California’s long history, Fort Ross was the only place on earth where Yerba Santa, wheat, and barley grew side by side. Now you can find this botanical Troika in a bottle or on draught at your local pub! This series of beer is fantastic in taste and quality. Knowing the history behind it makes it even better, great job Anchor Brewing!